OUT: Former Sport and Youth Affairs Minister and Minister in the Ministry of Housing Darryl Smith at Monday’s sitting of Parliament. PRIME Minister Dr Keith Rowley did what he had to do when he fired Darryl Smith just one day after naming him as Minister in the Ministry of Housing and Urban Development, shifting him from the Ministry of Sport. This according to Government Whip Camille Robinson-Regis yesterday. “(The Prime Minister) had to act in this way,” she said. Smith has been under increased scrutiny since Newsday reported on March 25 that $150,000 was paid by the Ministry of Sport to Smith’s former personal assistant Carrie-Ann Moreau to settle a wrongful termination lawsuit. It is alleged that Moreau’s firing came after she complained of sexual harassment by Smith. In a witness statement she said after complaining, Smith made it difficult for her to do her job. The matter went to the Industrial Court, but before the issues could be ventilated, the ministry chose to settle with Moreau to avoid a potentially more substantial pay-out. The details of the settlement are the subject of a non-disclosure agreement. Robinson-Regis, who had initially dismissed Newsday’s queries about Smith’s possible misconduct in office as a “non-story”, played a key role in his eventual sacking. She told Newsday that Rowley had asked her last week to investigate the process behind Moreau’s allegations, and the ministry’s ultimate settlement. Robinson-Regis told Newsday yesterday she first met with officials at the Sport Ministry on April 4. After her initial meeting, she requested additional information after which she gave Rowley her report over the weekend. Her report, she said, helped Rowley make his decision to reshuffle the Cabinet, which he announced on Monday. Smith’s reassignment as a minister in the Housing Ministry meant he was no longer a part of the Cabinet. New information came to light after the reshuffle, she said, prompting Rowley’s latest decision to sack Smith. She did not divulge what that information was. Sources told Newsday, however, that Moreau now works at Udecott which falls under the Ministry of Housing. 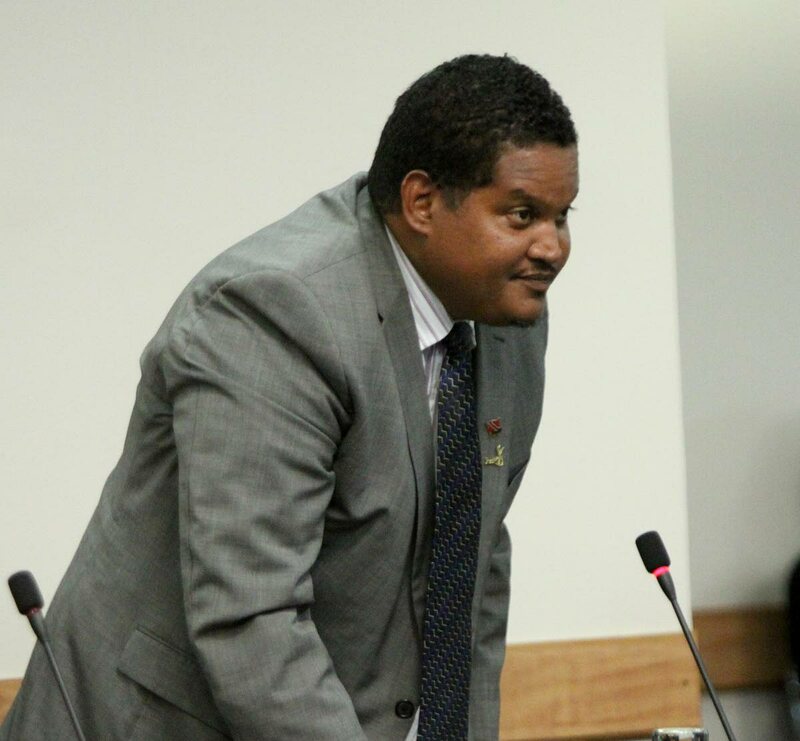 Robinson-Regis said Smith, a former Diego Martin Regional Corporation chairman, remained “very loyal to the party.” Smith’s whirlwind tenure in the Housing Ministry, which saw him answer a question in the Parliament on Monday, makes his stint even shorter than Port of Spain South MP Marlene McDonald’s ill-fated time as Public Utilities minister. Her appointment on June 30 last year was revoked two days later, after concerns were raised about the presence of Sea Lots resident Cedric “Burkie” Burke at her swearing-in at President’s House. The OPM’s release also said a committee, chaired by former permanent secretary and human resources expert Jackie Wilson, Folade Mutota of the Women’s Institute for Alternative Development, and attorney Elaine Greene, to “thoroughly review” Moreau’s dismissal and compensation, will be established. The committee is expected to submit a report in two weeks. “It is anticipated that all parties involved in any non-disclosure arrangement in this matter will lift such impediment so as to allow the fullest examination of the facts for the benefit of the public,” the OPM said. Newsday had requested all public documents for Moreau’s case, but was told by the Industrial Court that they were exempt under the Freedom of Information Act. Attorney General Faris Al-Rawi and Minister in the OPM Stuart Young, had defended the use of non-disclosure agreements when questioned by Opposition MP Barry Padarath on the matter in Parliament on March 28. Young admitted that the Sport Ministry used at least two legal opinions when determining how to settle the case and there is nothing “untoward” with using such an agreement. Al-Rawi added that such agreements are standard when there is no admission of liability. He also dodged a direct question from Padarath about whether Smith had been a part of Moreau’s case in the Industrial Court. On April 2, Robinson-Regis, also chair of the PNM Women’s League, maintained the government’s non-committal stance, telling the Newsday that the media was making a story out of a non-story. “I don’t know if you all are pursuing real issues (instead of) trying to set an agenda,” she said. Reply to "ONE NIGHT STAND"